without any adjustments, or need for continual tool reversal. Light, Unbreakable ( in normal use ) Diestock with permanently bonded Die and Guide. Combi-die is light in the tool box or hangs on workshop toolrack with, protective wallet supplied. 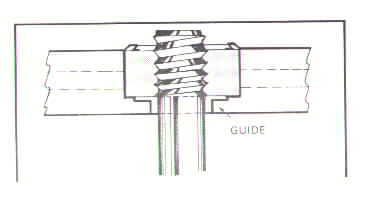 Guide holds cutting die in correct alignment with the workpiece. Combi-die promotes square cutting, prevents uneven threads an so improves die life. Available in UNC, UNF, Metric, BSW, BSF and BA sizes.